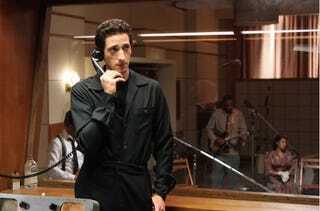 Adrien Brody in "Cadillac Records"
What would you do if you were the next Jean-Michel Basquiat, selling your original art — silk-screened T-shirts — out of the trunk of your car? What if your child created a software program for fun that could be worth billions of dollars? What if you were a musician whose latest release played in clubs all over your city? In all three instances, the right answer would be: Seek out the advice of a lawyer to protect your intellectual property. But for most creators, the work comes first. Money will follow — right? All too often, when it comes to intellectual property, black artists are the ones who lose the rights to their work. "It's not hard to get our community excited about music, art or fashion — we need to get out there in the communities to protect that work," said Lateef Mtima, founder and director of the Institute for Intellectual Property and Social Justice at the Howard University School of Law. He stood behind a podium making his best sales pitch to the assembled Capitol Hill crowd: Protecting intellectual property is essential for today's artists — and entrepreneurs. Mtima is partnering with the NAACP and Google to take intellectual property discussions out of legal journals, courtrooms and academia and to bring them to artists, scientists, technologists and creators of all stripes. He hopes to get more people, particularly young black entrepreneurs, interested in protecting themselves, and their work. Unfortunately, this may be an uphill battle. Intellectual property is essentially intangible creations. Defined by the World Intellectual Property Organization, "Intellectual property (IP) refers to creations of the mind: inventions, literary and artistic works, and symbols, names, images, and designs used in commerce." All of this law sounds like long, dry, boring legalese — that is, until we start dredging up the ghosts of black music past. Case in point: an iconic 1954 Time magazine cover portraying the face of jazz — Dave Brubeck, not Dizzy Gillespie, Miles Davis or Duke Ellington. Mtima pointed to the Time cover as an example of how an art form that was pioneered by African Americans — our intellectual property — gets completely and thoroughly co-opted. This type of situation comes with a dual cost: Historically, white artists would cover the music of black artists and receive more accolades, higher rates for touring and more opportunities. The same black artists would die in debt and obscurity. But intellectual property law also favored the person who was able to file first — so a performer could create a jazz standard that played in the clubs, but if that performer was not the first person to record it, distribute it and secure the rights, he may not see any money from the song he created. And the person who owned the rights to the song (or the rights to a similar song) could eventually force the performer to stop playing it, losing both revenue and notoriety. That didn't just happen during the jazz era. It continues today. Many hip-hop pioneers also ended up destitute even as they created an entirely new genre and art form that is popular the world over. This is because of how intellectual property is managed. In the world of music, a lot of intellectual property battles come down to who owns the publishing rights for songs. So the creator and performer of the song played on the radio isn't the person who is paid when the record spins — often, it's split with the person who owns the rights. And that split may not be in the artist's favor. In the early days, studios kept a stranglehold on publishing rights, profiting from artists who finished their days both beloved and in the poorhouse. Darnell Martin's 2008 film, Cadillac Records, was based on the real-life company Chess Records, which had some questionable practices. The reason Chess was nicknamed Cadillac was that the Chess brothers would buy their artists shiny new Cadillacs upon record release — but for years after, artists would fight to receive royalties and payment for their songs, since the Chess brothers counted the Cadillac as the advance. Many jazz legends had a complicated relationship with the Chess brothers. Even as they were able to rise to fame based on the artistic development Chess Records fostered, as they became more savvy about profit and publishing, many also felt cheated. But publishing isn't all there is to intellectual property. It has applications in medicine, science, technology and art. But the bottom line is the same: protecting the idea before someone else is able to take it, trademark it and reap the profits. On the panel, Natasha Eubanks of TheYBF.com described how, once a concept becomes popular, people will try to poach your connections, contacts, brand and audience — so hiring a good legal team is vital. Marcus Johnson, musician and CEO of FLO Brands, emphasized learning the business. "I know sorry musicians that have nice houses — because they got the business side right," he said. A legal team is critical, but many of the young, black and talented don't seek out expert advice until it is too late — which leaves them wide open for exploitation, just like our artistic ancestors. As Mtima and Steven D. Jamar write in the New York Law School Law Review, "Social justice includes not only access to, but also inclusion in, the social, cultural, and economic life of the country. Indeed, it extends beyond inclusion … to full participation in and ability to affect the direction of civil society in all its manifestations." If black creators don't own the rights to their work, we lose out economically and culturally. Intellectual property matters. And the creative future of a generation of young black artists depends on us learning how to leverage the law to our advantage.